OMEGA ® Diaphragm Pressure Seals afford greater protection to sensitive pressure instrumentation from the damaging effects of corrosives, slurries, or viscous fluids that may be present in your pressure line. A variety of designs and styles are available to suit your application requirements. Distinguished by its 3-part design, the 100 series includes a PTFE coated diaphragm capsule which threads into the top housing, assuring positive sealing at all surfaces and minimizing the possibility of any leakage of the filling fluid from the system. The diaphragm capsule can be replaced without replacing the top housing. Continuous duty is assured: should the sensor be removed from the diaphragm seal, the process fluid is prevented from escaping. Easy cleaning and inspection of the diaphragm can be achieved during shutdown conditions by detaching the top and bottom housings. This design eliminates the need to refill the seal or recalibrate the instrument when the top and bottom housings are separated. A FKM O-ring, compatible with all standard fill fluids, and a PTFE back-up ring make a seal between the diaphragm capsule and the top housing. The diaphragm is PTFE coated to provide an integral gasket, thus assuring a leaktight connection between the diaphragm and bottom housing. The 100 Series consists of a diaphragm capsule with a corrugated, metallic diaphragm edge welded to a sturdy back-up plate which threads into the top housing. Once secured, the top housing can be bolted to the bottom housing. The bottom housing has a standard 1/2 inch NPT fitting which easily threads to the process piping. Virtually identical to the 100 Series in both performance and design, the 102 Series includes a standard #150 raised face flange in place of a threaded female NPT process fitting. For more rugged applications, an optional #300 raised face flange is also available. The 202 Series diaphragm seal features a bonded PTFE diaphragm and a PTFE #150 raised face flange. This all-PTFE wetted construction provides ruggedness and maximum corrosion resistance to acids, caustics, alkalis, ketones, hydrocarbons, and alcohols. In the new 202 design, the PTFE diaphragm is bonded to the top housing, allowing the top housing and instrument to be removed without losing the fill fluid. 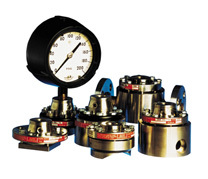 Diaphragm seals must be ordered as an assembly with the appropriate pressure transducer, gauge or switch listed above. Consult Pressure Engineering Department for pricing and availability.